Israeli Prime Minister Benjamin Netanyahu told reporters on Monday that an airline flying to Tel Aviv has been granted access to Saudi Arabia’s airspace. A spokesman for the airline, Air India, denied the claims stressing they had not received any confirmation and had only submitted a request for a flight along that route. If approved, it would be the first time Saudi Arabia allows commercial flights to fly to Israel to use its airspace and would signal a significant shift in policy that has shaped the region for decades. Israeli Prime Minister Benjamin Netanyahu told reporters on Monday that Saudi Arabia has given permission to an airline flying through to Tel Aviv to use its airspace. “Air India signed an agreement today to fly to Israel over Saudi Arabia,” he said during a briefing in Washington, DC on Monday, according to Times of Israel. Currently, Saudi Arabia does not recognise Israel and has banned any flights to the country from using its airspace for more than 70 years. If Netanyahu’s claims are correct, it would mark the first time Saudi Arabia has allowed commercial flights to Israel to use its airspace, and would signal a significant shift in strategic policy in the region. But an Air India spokesman denied the Prime Minister’s comments several hours later, stressing they had not received any confirmation and had only submitted a request for a flight along that route. “We have yet to receive anything from authorities,” Air India spokesman Praveen Bhatnagar told The Times of Israel. Saudi Arabia’s aviation authority did not respond to requests for comment from Business Insider. Last month, Air India confirmed it had begun plans for three faster weekly flights between Israel and India, although Saudi Arabia’s aviation authority was quick to deny reports that its airspace would be used. 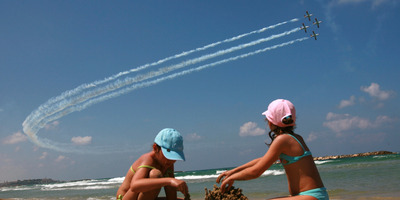 At the time, Israel’s Airports Authority told Reuters the service was set to begin in early March. Currently, Israel’s national airline El Al is the only airline offering direct flights from Israel to India. The route avoids flying into neighbouring Saudi Arabia’s airspace by diverting to the Red Sea and around the Arabian peninsula, adding two hours to the overall trip. If Saudi Arabia were to ease its airspace regulations it could be seen as concrete evidence of warming relations with Israel and a broader re-configuring of regional alliances.